“Resilience” is frequently discussed in the fields of Education, Psychology, Personal Development, Health and Business today. Personal resilience and resourcefulness are developed day by day as we deal with difficulties and challenges, some much more severe than others, but all valuable in helping us to build our resilience muscles. Resilience is the power to adapt well to adversity. It is the process of coping with and managing tragedy and crisis in your life. It is ‘bouncing back’ from hard times, such as natural disasters, terrorist attacks, financial difficulties, health challenges, business obstacles, exam preparation, saying goodbye to a loved one, dealing with failure, managing expectations etc. The above quote is taken from “Duct Tape Isn’t Enough” by Dr. Ron Breazeale. Dr. Breazeale has spent many years in the work of building resilience in individuals, communities and regions. We assert that resilience is a skill that can be learned and offer services and tools to do so. 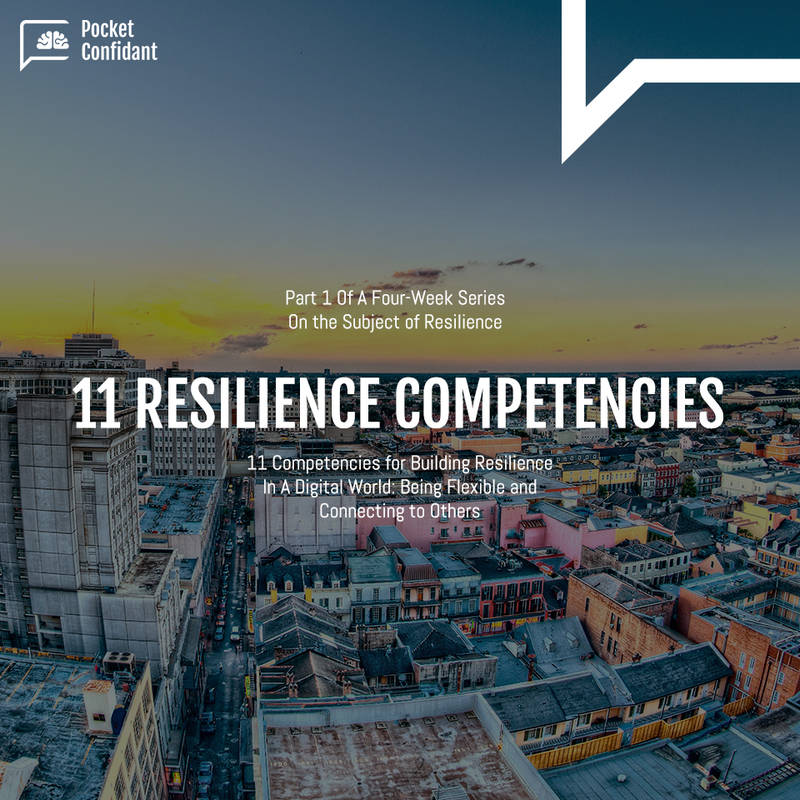 After reading Dr. Ron Breazeale’s article in Psychology Today on “Eleven Skills and Attitudes That Can Increase Resilience”, we looked at how these eleven could be supported and accessed through the use of technology. At PocketConfidant AI we are seeking to build and increase the capacity for individuals, communities, regions and nations to be more resilient; we envision the possibility of a better life and better world for all of us, and want to make a positive and meaningful contribution. We are building an Intelligent coaching technology powered by Artificial Intelligence accessible 24/7 on any chat interface. It is designed to support individuals navigating life’s challenges and transitions and is a smart app that guides the user through a questioning cycle asking the right question at the right time. It organizes user’s thoughts, facilitating a stepping back from emotional challenges and allows for and facilitates reflection and the formulation of a plan. Our goal is to provide anyone in the world with efficient, real-time, safe and private support using “coaching as a service” in a digital technological tool. Our vision is to build an ethical and impactful solution that anyone can benefit from; which is influence-free, does not push information or solutions towards the user and does no harm. With backgrounds in Computational Neuroscience, Education, Entrepreneurship, Design and Coaching, we are a team of 5 different nationalities varying in age from 26 to 60, who are driven by passion and creativity. In 2014 we were asking ourselves the question “how can we help empower people, at scale, and at minimum cost?” Our work and development is the answer to that question. We are finding a way to scale the acquisition and delivery of important life-skills for individuals in a personal, private and on-going way. Relationships that provide support and caring, both within and outside the family, that offer love, encouragement and reassurance – e.g talking with a friend. Although the importance and value of face to face and in person relationships can never be diminished, the reality is we are living in an increasingly virtual world, where we use mobile devices as an extension of ourselves… We connect to others through Facebook, Snapchat and other social media sites. We feel connected at 3 am when we can follow a friend’s day through their posts. Something happens that sparks our thinking of someone and while the time is not right to pick up the phone and call, we can, and do, send a quick message to connect. We can agree that exclusively digital exchanges are not good for human wellbeing but there is certainly a time and place today for conversations within these devices. Mobile devices and virtual platforms are personal, self-paced and (based on user preference) private spaces where individuals feel comfortable to open up and share what’s going on in their lives. It is also where they seek support. This is why we are reaching out to individuals on their preferred chat interfaces, in a confidential way with powerful dialogue techniques, to help them self-reflect, express their concerns and challenges, question themselves and identify solutions and or actions to move forward. Feeling empowered as a result of identifying and creating action steps to deal with one’s challenges brings increased self-confidence, and in this more open and receptive state, a desire to connect more frequently and closely with others. Flexibility in thinking and actions – e.g. willingness to try something new. Mobile devices and the internet have given us perhaps the maximum flexibility we could imagine in our daily life. Ordering a pizza while in the metro, browsing a bookstore from home, making a doctor’s appointment at midnight, or reaching out to family and friends while commuting would all have been impossible 20 years ago. We reach for our mobile devises for solutions to our needs of daily living all the time. In our super fast-moving world, we need to pause, reflect and find the reset button. When we become aware of a strategy not working for us it is time to reflect on the actions we are taking, evaluate their efficacy and seek new ways of thinking. Being able to access a personal space for reflection and evaluation anywhere, at any time, on any platform, that records our thinking and processing of the problem and our chosen solution, gives us a way to develop improved flexibility in our thinking. We are thrilled to be partnering with Dr Ron Breazeale and his team to bring resilience skills to an ever-expanding worldwide audience via the use of technology. We are discussing here how technology can increase access to these skills via mobile devices. In writing this article our intention is to open the dialogue to what advances Artificial Intelligence can bring, how it can support existing initiatives and give millions more people access to programs of self-development. We would love to hear from you, whether you are a follower of tech and the current conversations around Artificial Intelligence, or if you have never considered the potential of applying Artificial Intelligence in such a context. What are your thoughts? How does reading this article make you feel? Have you encountered some of the situations or skills that are mentioned here? Are you a mobile device user trying to solve personal and day-to-day life issues on your own? How do you feel about the fast pace and constant development of science and technology? Stay tuned for next weeks’ series. Contact us to share any thoughts, we will read with great curiosity and interest.